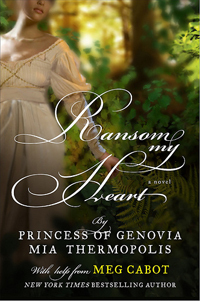 Her Royal Highness Mia Thermopolis, Crown Princess of Genovia–whose published "Diaries" have been a #1 bestselling sensation–now graces the world with her first novel of danger, desire, and timeless romance"¦with an introduction from Meg Cabot! He’s a tall, handsome knight with a secret. She’s an adventurous beauty with more than a few secrets of her own. Finnula Crais needs money for her sister’s dowry, and fast. Handsome Hugo Fitzstephen, Earl of Stephensgate, returning home to England from the Crusades, has money–saddlebags of gold and jewels–and lots of it. What could be simpler than to kidnap him and hold him for ransom? Especially when he’s more than willing to allow himself to be caught by such a winsome captor. Well, for starters, Finnula could make the terrible mistake of falling in love with her hostage, only to realize he’s been lying about his identity all along "¦. But then, so has she. Now their lives—and the lives of everyone they know and love—could be in mortal danger. Is Finnula in hell? Or is she in heaven?